The e-LineUP! 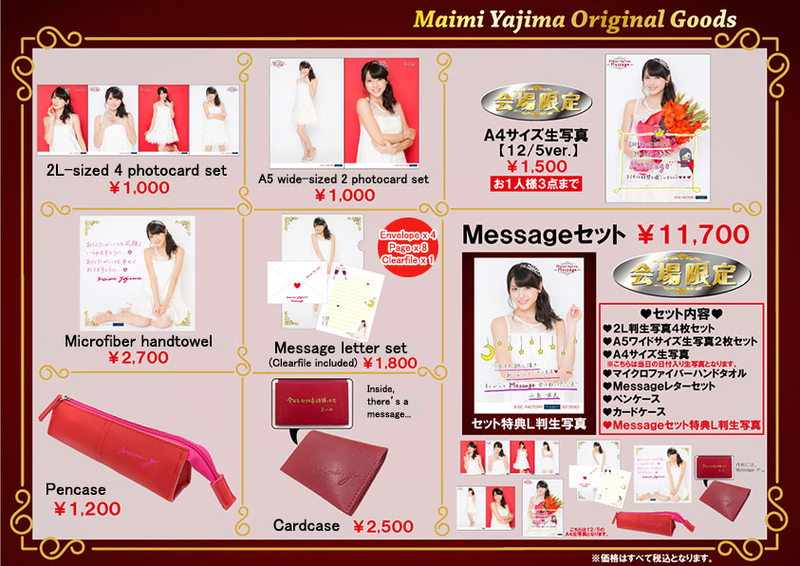 website has released a preview of the goods for Maimi’s upcoming premium casual dinner show “Message”. The goods not marked “venue-exclusive” (会場限定) will be available on e-LineUP! starting December 5th at 3:00PM Japan time. As with all goods on e-LineUP!, overseas fans can use TENSO to place their order, and I’ve translated the descriptions for the items that will be available in the above image. Posted on December 4, 2014, in News and tagged Yajima Maimi. Bookmark the permalink. Leave a comment.